What company for door panels? 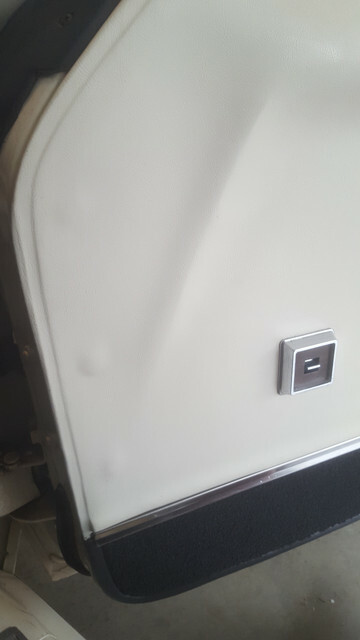 › What company for door panels? Who has the best fit and finish for deluxe door panels for a 72 mach 1? TMI?? Other?? (04-06-2019, 11:00 AM)scgamecock Wrote: Who has the best fit and finish for deluxe door panels for a 72 mach 1? TMI?? Other?? IIRC, over the years, Mustang Market has been the ones to get. Johhny - your clips may not be seated all the way, or are bent. I also went with the Mustang Market door panels. They are cheaper than TMI, fit and predrilled holes all seemed to line up with parts moved over from the old panels. You have to cut out the area for the cup and lock but thats true of most of them. I also noticed the slight bumps on the front of the panel but still acceptable. Color seemed slightly different than TMI but it matched what was in the rest of the car and also matched the SEM vinyl spray used to touchup other parts. I just looked at Mustang Market and they appear to be the way to go. What cutting do you have to do on them??? Pretty easy? I would hate to spend $330 and screw them up! The biggest job is cutting out the area for the door cup. It isnt that difficult if you take your time and cut a smaller area than trying to cut the whole thing all at once. In putting the door pull handle on, it can be trimmed ( with a dremel ) since its molded rubber, if necessary to make it fit better with big gaps removed from top and bottom. Someone sells door clips with padding on them, just can't remember where I bought my clips. Wade, did your car originally have the deluxe interior or standard? I think there’s a difference in mounting the door panels or maybe it has to do with the door opener. I’m just saying that if you are changing from standard to deluxe, then I think you have to do some kind of modification. (04-10-2019, 07:57 AM)jpaz Wrote: Wade, did your car originally have the deluxe interior or standard? I think there’s a difference in mounting the door panels or maybe it has to do with the door opener. I’m just saying that if you are changing from standard to deluxe, then I think you have to do some kind of modification. Mine came with the deluxe interior. Hopefully it will just be a straight forward install. The interior was missing when I bought the car all but the seats and dash. So I will be installing without the benefit of uninstalling first.